Matt Abts Signature Djembe Cajon (11'' X 20") with free bag! This woodtop Djembe Cajon is handcrafted in Putney, VT by Everyone's Drumming using Vermont Hardwood for the shell and 5 ply high quality birch for the head. The shell has a walnut finish coated with 4 coats of polyurethane. The head has a hand rubbed oil finish with the Matt Abts Signature Logo on it. 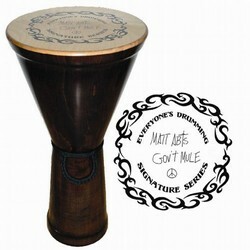 I recently purchased 2 of the Matt Abts djembe/cojon drums. May I say this little hand drum is SWEET! Talk about tone!! Man, the birch top has a life of its own, and the drum has this awsome range of tone about it. I am surprised at the depth and richness of the bottom end tone you can elicit from the drum. My challenge will be to play this instrument in such a way as to bring out melodic voices waiting to be released! Matt, of course, is the master, so if I can get part of the way there I will be very happy with it. And I feel this djembe is a keeper, for as it ages it will only offer more stories to tell. As I said I bought two and gave one a good friend....also a drummer. He has gone away in his little world experimenting with the voice inside the drum also. Too cool! Thanks Matt Abts and Nathaniel at Everyone's Drumming for a great, lifetime quality, instrument.